After being apprised of an issue with heat transfer through PCB traces, being the stubborn idiot I am, I had to try and solve the problem. The issue is with a particular PCB that has a cutout section with a thermistor placed in a partially isolated section within the enclosure, unfortunately the traces themselves are serving as a heat transfer conduit especially so since copper is a particularly good conductor of heat. After thinking about it for a while I came up with a couple of ideas like calibrating the calculated output to accommodate for the temperature discrepancy, however that probably wouldn’t work without a second thermistor closer to the heat source, accounting for the difference. Another idea I had was to use an infrared thermopile but they’re kind of large and expensive and would require a heat channel mounted above it to prevent measuring the temperature of the case. After thinking for a while about it, the simplest answer I could come up with would be a heatsink to mitigate the heat transferred to the thermistor. While it is theoretically impossible to totally remove all heat difference, I believe that a large portion of the heat transfer can be eliminated. So I wanted to see if heatsinks actually help equalize heat much at all so I devised a bit of a rough experiment. I decided the quickest way to test this would be with materials I already had. 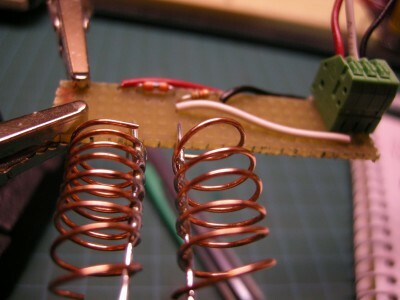 I have a selection of thermistors so I used a glass axial thermistor. 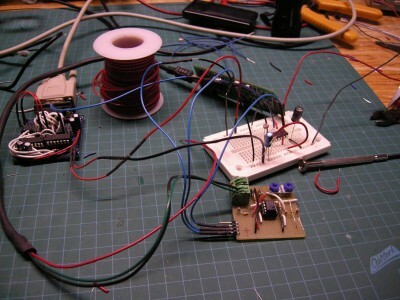 This is the thermistor board used in the experiment. the thermal leads aren't attached. The thermistor used is a glass 10kOhm NTC Thermistor in series with a 1k resistor in order to detect current/divide voltage. 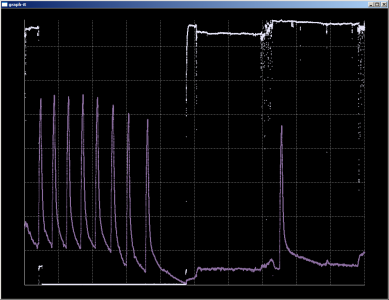 With the setup above, the voltage detected from GND to the divider is 438mv. the temperature in my basement is pretty steady since the furnace isn’t running. So now I attach the leads. This is the board with the two 22AWG leads attached. I also performed the test with the leads closer to the thermistor. I used Teflon coated wire to prevent conduction between the two sides and used my soldering iron as a heat source since it’s temperature controlled. I let the heat soak up through the lines for 10 minutes to ensure that the heat stabilizes at the thermistor. 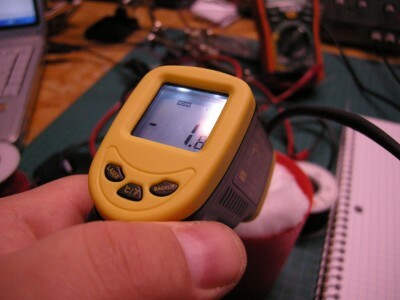 I also performed a test with the soldering iron closer to the sensor. Finally, I decided to place a heatsink on the line. I was going to solder aluminum shims to the leads in order to provide for heat sink. That turned out to be difficult at best, so I used coiled up copper wire and soldered it to the leads. 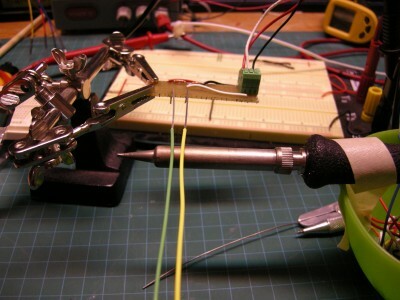 I performed the same two tests with the position of the soldering iron. Anyways, here are the results of the test. It should be said that this test is far from perfect and doesn’t prove anything quantitatively with any real degree of accuracy, however I wanted to see how effective even a rudimentary heat sink would be in a situation like this. It should be noted that while thermistors are inherently non-linear, we have voltage drops of 43% and 34% with the short and long leads respectively. I simply thought it was an interesting experiment. I have a few ideas on how to sink the heat or account for it but I think the heatsink is the easiest plan. 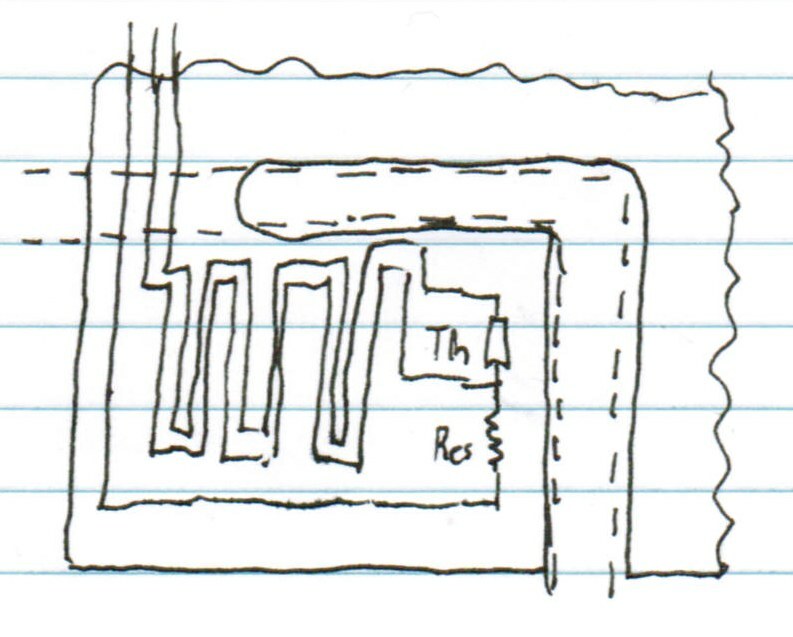 Here’s a beautifully rendered image of the idea to reduce thermal linkage between the PCB and the thermistor ;). 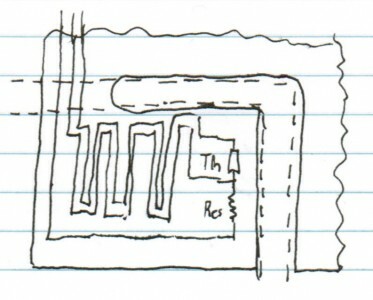 The thermal isolation idea. 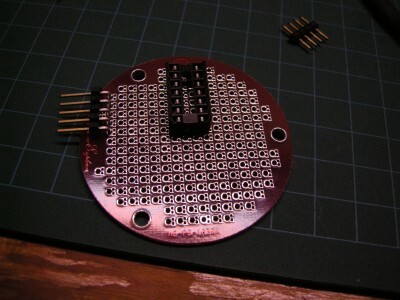 By placing a heatsink on the exposed traces one could mitigate the heat transferred to the thermistor. If there were a heatsink over the exposed traces and the traces made as long as possible, it should be possible to bring the traces fairly close to ambient. Like the experiment showed, even a rough heatsink was able to reduce the heat going to the thermistor by a substantial degree. Well, It’s been a number of days since I built the unit and all’s been tested. 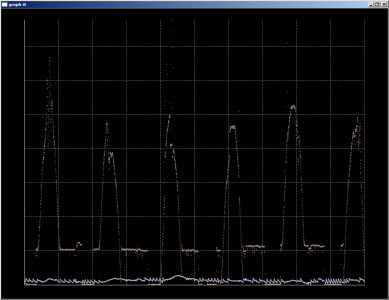 Here is a picture of some of the data from my living room over the past several days. The purplish is the temperature and the lighter one is the ambient light. You can see that as the light levels get higher, the furnace stops, thus the temperature stops fluctuating. 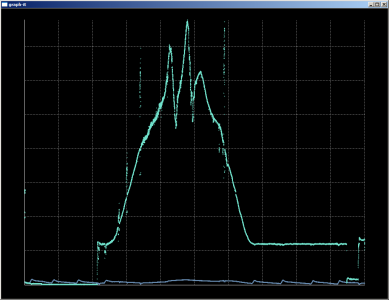 Sorry about the small scale of the temperature graph, the graphing program is still a work in progress. 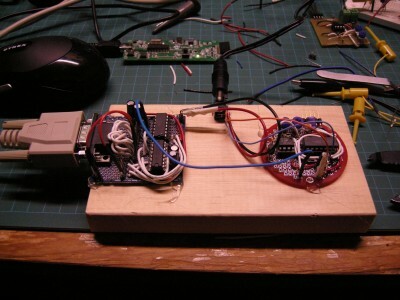 So, since I’m really bored I decided to build a device that tracks ambient temperature and light levels. While this may not seem very interesting, I suspect the relationship between the two, while not directly linked, will be interesting especially when placed outside. Well, I suppose I’ll put a few pictures up and outline some of the stages I went through to get it to this point. 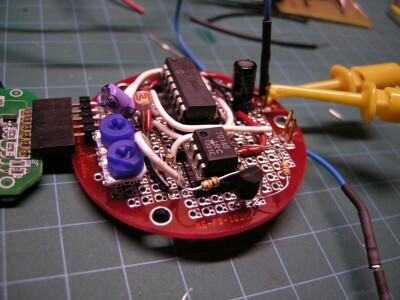 The initial version of the sensor, using older stuff from viscometer project. This didn’t take long. I already had a board with a single supply opamp (JRC 7014D) on it that was already set up for the LM335Z temperature sensor. 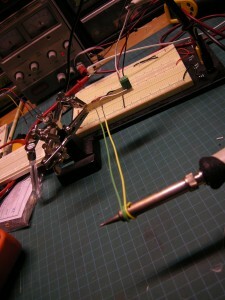 I used a bread board, as can be seen in the picture, and used a messy bunch of wires coming from the PICKIT2 to the MCU. I chose a PIC16F684 for this job since it has some analog channels and it doesn’t have too many pins. 2. Checking it out. 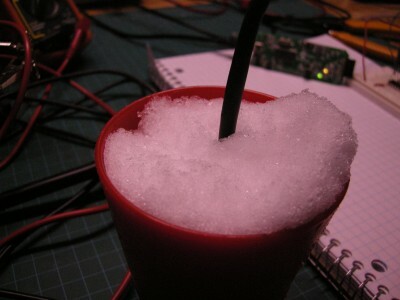 In order to see if the Voltage range will allow for freezing temperatures and room temperature, I had to test it with some snow. The voltages swung just fine with a bit of extra range. I have about 50C to work with in range, good enough. 3. Making the board. For this I used a board from measurexplorer. I have tons of these but haven’t had much luck using them. The only ones that have worked well for me are the ones with 3 holes per pad. Anyways, here are some pictures. Anyways, This board took me a couple hours to make but it works well and required no rework, thankfully. You can see both the LM335X (TO-92) and the CDS for sensing the light. This board interfaces to an RS232 board that I’ve made and that I use for some of my other projects. 4. Getting ‘er running. While the unit itself is already programmed in terms of the MCU. it needs some adjusting for voltage on the pot and that’s about it. now to affix it to something so it doesn’t move around. 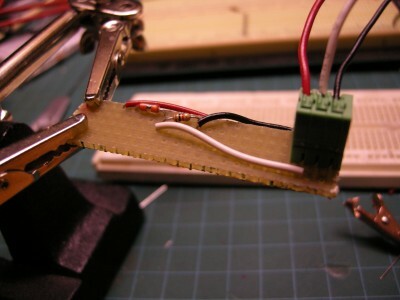 As you can see, I simply used hot glue to affix both the RS232 board and the sensor board to the block of wood. Its a temporary arrangement while I come up with a good enclosure for outside. 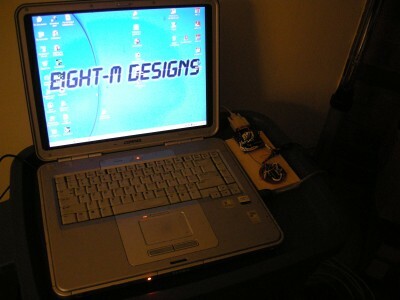 I brought my old laptop out into service for this project, works well just for collecting data. Anyways, here are some images of some collected data. Well, so far so good. Now I’ll make the enclosure for outside and improve the sampling. hopefully I can leave it out all spring/summer and see the patterns.